Of all the small, accent tattoo designs, cute bumble bee tattoos must be the most appealing and eye-catching little gems of all! Who doesn’t like bumble bees? When you think of them, you think of nectar and honey, summer flowers and fat, lazy buzzing insects that are perfectly content to do their own gentle jobs and harm no-one as long you as they are left alone. They are not like wasps, which are outdoor (and indoor) menaces, incapable of allowing you to sit in your own garden, minding your own business, without invading your space, your drink, your food and your body. There is definitely nothing cute about wasps! Back in ancient Egypt, bees were believed to represent the soul and sacred offerings of honey were included in tombs of the dead to ease the transition into the after-world. In Greek mythology, the word ‘honey-bee’ translates into the girl’s name ‘Melissa’ (‘meli’, being Greek for honey). Melissa was a nymph and nursemaid to Zeus and, instead of feeding him milk as an infant, gave him honey instead. It certainly did not seem to do Zeus any harm as he became the ruler of the heavens and honey became known as the nectar of the gods. Because the bee is a hibernating insect, it became, in common with several other creatures, a symbol of rebirth or regeneration. Whilst the humble bumble bee is not a honey bee, it is still imbued with these connotations. 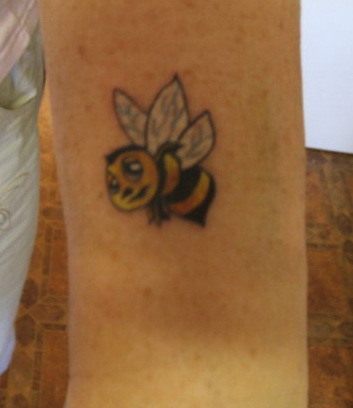 Bumble bees tattoo designs chiefly symbolise honour and duty as they spend their lives serving their queen. They are like busy little servants in the garden, working tirelessly to pollinate and gather nectar and because of this they have been attributed with many positive symbols. Emperor Napoleon had bees sewn into his coronation robes in gold thread in recognition of their loyal and industrious natures. They therefore became imbued with the positive attributes of patient industry, which reaped its just rewards. 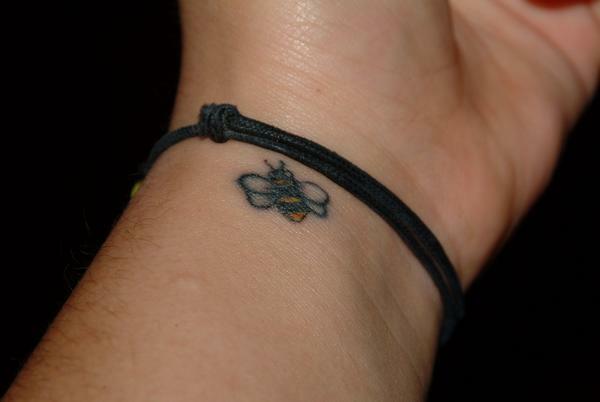 The bee is extremely decorative and has been the subject of some of the finest jewellery artefacts in the world so it is hardly surprising that it is growing quickly in popularity as a tattoo design. 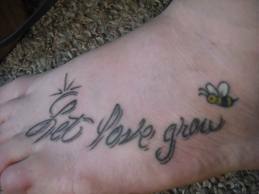 Cute bumble bee tattoos have a great appeal for women because of the multitude of design options they can offer. They can be incorporated effortlessly into other pretty designs, such as flowers or foliage, or personified with human faces and bodies. They can be intermingled with fairy designs, forming the fairy body or encasing fairy wings. This is all very whimsical, but its appeal is immediately apparent. 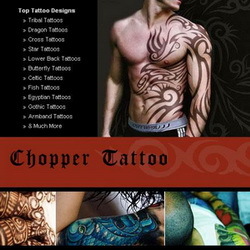 Another pretty design which is extremely popular is to depict the trail of the bumble bee in voluptuous loops as it buzzes lazily from flower to flower – but you need to have a very clear idea of this in your mind to present to a sympathetic tattooist in order to avoid the possible effect of a drunken-looking bee! Cute bumble bee tattoos can be black, two-toned or multi-coloured and, wherever you display these pretty little creatures, they will be sure to attract attention like bees to the honey pot!